Former President Jimmy Carter, former first lady Rosalynn Carter and former Secretary of State Condoleezza Rice will be among the dignitaries who will speak Wednesday evening at a tribute to Rev. Theodore M. Hesburgh, C.S.C., the president of the University of Notre Dame from 1952 to 1987 who died Thursday at age 97, the University’s president, Rev. John I. Jenkins, C.S.C., announced Monday (March 2). The tribute will begin at 7:30 in Purcell Pavilion at the Joyce Center on campus. It will include music from Notre Dame student choirs and instrumental groups and reflections from the Carters, Rice, Father Jenkins and nine other guests. A limited number of tickets for the general public will be made available beginning at 3 p.m. Tuesday (March 3) at the Murnane Family Ticket Office at Purcell Pavilion. The tribute also will be shown on video boards at the Compton Family Ice Arena at Notre Dame and other campus locations as needed and will be streamed online. The Carters were close associates of Father Hesburgh for almost 40 years. 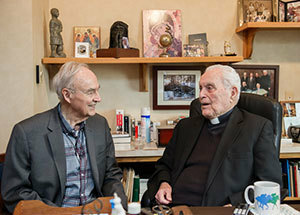 The president regularly turned to Father Hesburgh for advice and appointed him as chair of the Select Commission on Immigration and Refugee Policy. Father Hesburgh and the first lady journeyed to Southeast Asia on a fact-finding mission in the 1970s that led to an effort that averted mass starvation among Cambodian refugees. Rice, a former Notre Dame Trustee, earned her master’s degree from Notre Dame and likewise knew Father Hesburgh for four decades. In addition to serving as the 66th secretary of state, she was the national security adviser to President George W. Bush and a provost and faculty member at Stanford University. Cardinal Theodore McCarrick, the archbishop emeritus of Washington, D.C.
Visitation for Father Hesburgh at the Basilica of the Sacred Heart will begin at noon Tuesday until 6 p.m. A private wake service will take place Tuesday evening, and the visitation will resume at 9 p.m. and continue through the night until 10 a.m. Wednesday (March 4). Members of the public are invited to pay last respects to the longtime Notre Dame president during those times. A private funeral Mass will begin at 2 p.m. Wednesday at the Basilica, to be followed by a procession to Holy Cross Community Cemetery. The public is again invited to line the processional route to pay last respects. Also on Wednesday, Gov. Pence has ordered that all flags in Indiana be flown at half-staff in honor of Father Hesburgh.